The EZ-FLO 1-Gallon Hose Bib Constant Pressure System can be used in an on/off pressure set-up of not more than 80 PSI. Use with your garden hose, a drip system or a single zone irrigation system after the zone valve. EZ-FLO injectors are an economical choice for fertigation. 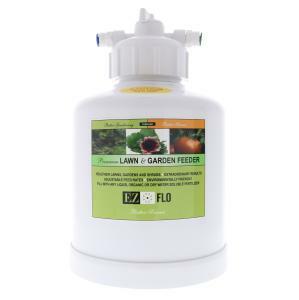 With the adjustable mix ratios, fertilizing with the EZ-FLO units is flexible and easy. The EZ-FLO injectors are ideal for backyard gardeners, commercial landscapers and small farms. Just fill the tank, with 100% water soluble dry fertilizer or a concentrated liquid fertilizer and set the adjustment valve - it is that easy! The hose threaded EZ-FLO units include the cap, a hose bib adapter, which connects directly to an outdoor faucet and hose thread backflow preventer (sold separately), the inlet/outlet bypass tubing with barbed on/off valves and a set of flow discs for low flow applications. Units can also be connected to a main water line with an EZ-FLO Ball Valve Coupling (sold separately). All EZ-FLO fertilizer injectors must have a backflow preventer installed to prevent fertilizer and other contaminants from entering your potable water supply. Please Note Warranty Limitations: EZ-FLO hose and drip systems (Models: 1010 & Plug N’ Spray) will fracture tank seam if subjected to constant water hammer and may not be installed into an irrigation mainline before zone valves. The 1000 series injectors may be installed before a garden hose bib timer where water hammer is not present. Please make sure that all water pressure is relieved from the system by relieving the pressure on the hose or sprinkler unit when not in use. In addition, a 1000 series hose and drip unit subjected to operating pressures above 80 PSI (5.1 bars) will not be covered by Manufacturer Warranty.